In April 2004, the Hollywood Investigator announced its first annual horror film contest. That's right, a contest. Not a festival. 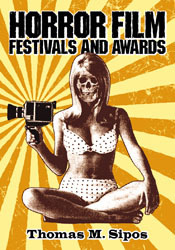 The goal was to showcase the very best horror films of the year. Filmmakers of every level of experience were eligible, from big studio directors to backyard independents. Nevertheless, the hope was to discover the next unknown talent. The next Blair Witch Project. Winners would be announced around Halloween, then promoted in the Hollywood Investigator. That was supposed to be the Big Prize. A promotional article. The contest needed a name. So it was called the Hollywood Investigator Halloween Horror Film Awards. No entry fee was charged. It was a new contest, and we didn't want people to think we were a scam, trying to rip off impoverished, desperate artists. Five winners were announced in October 2004. Four "Best" categories, and one Honorable Mention. (See complete Winners List at bottom). The Hollywood Investigator's promotional article got results! Rick Lavon secured a distribution deal for his comedic zombie short film, Stiffs by Sid, after a distributor read of its Best Horror Short Film win in the Hollywood Investigator. A screening was arranged for April of the following year. 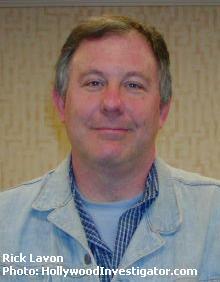 The 2005 World Horror Convention, which met in New York City, provided a room, a TV and DVD player, and several hours spread out over two days. There weren't too many entries in 2004. 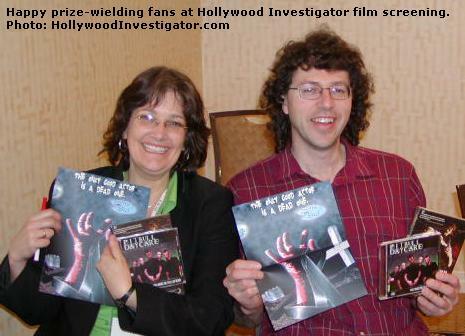 Few filmmakers knew about the Hollywood Investigator Halloween Horror Film Awards. Of the five winning entries, only Mr. Lavon showed up for the screening and followup audience Q&A. Three winners emailed us, excited but unable to attend. (Well, two of them sounded excited; the third sounded curiously mellow.) And the publicist who'd submitted Vlad -- she never responded to repeated notifications of Vlad's win. Although he missed the screening, Paul Hough (Best Horror Music Video for You Make Me Feel So Dead) did send some promotional gifts for the audience: DVDs of both his music video and his wrestling documentary, The Backyard. Mr. Lavon also brought freebies: posters of his winning film. These promo items were a crowd pleaser (see this happy Canadian couple, left). Thus did the 2004 contest end in April 2005, on a happy note. People saw free films and got free stuff. And one winner walked away with a distribution deal. Later in 2005, the contest was renamed the Tabloid Witch Awards. Same contest, different name. This historical continuity was made official on October 19, 2006, when the 2004 winners were officially declared Tabloid Witch Award winners.